One such field trip yielded a pattern in their new collection. As the story goes, senior designer Sarah Shea was working in the tide pools on a series of drawings—abstractions of sea foam floating in the ocean and water-eroded rock formations—using metallic gold ink. The result, a golden, lacy motif, aptly named Tidepool, became a scarf and eventually a design suitable for drapery in their upcoming spring 2017 collection. The team subsequently filmed the fabric floating in the Pacific waters to see how it fit in the environment that drove Sarah Shea to pick up her paintbrush in the first place. “Its ethereal quality validated the concept,” says Tamalyn Krecic Shea, the brand’s CEO and creative director. 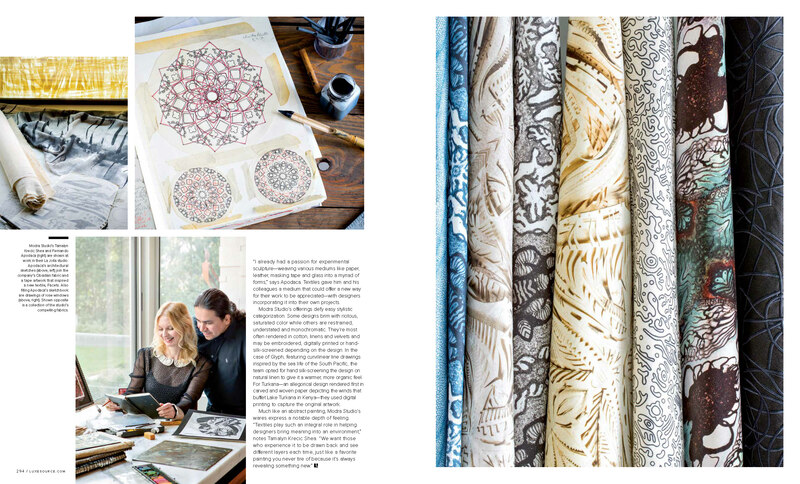 Modra’s dreamy textiles and wallcoverings hit showrooms in New York, San Francisco, and San Diego in 2016, including Studio Van Den Akker, De Sousa Hughes, and Becky Walker and Associates, but the company’s origin dates to 2008, when Tamalyn Krecic Shea and Apodaca met at a fund-raiser. By 2011, they were discussing how textiles derived from fine art could tell a story. “I already had a passion for experimental sculpture—weaving various mediums like paper, leather, masking tape and glass into a myriad of forms,” says Apodaca. Textiles gave him and his colleagues a medium that could offer a new way for their work to be appreciated—with designers incorporating it into their own projects. 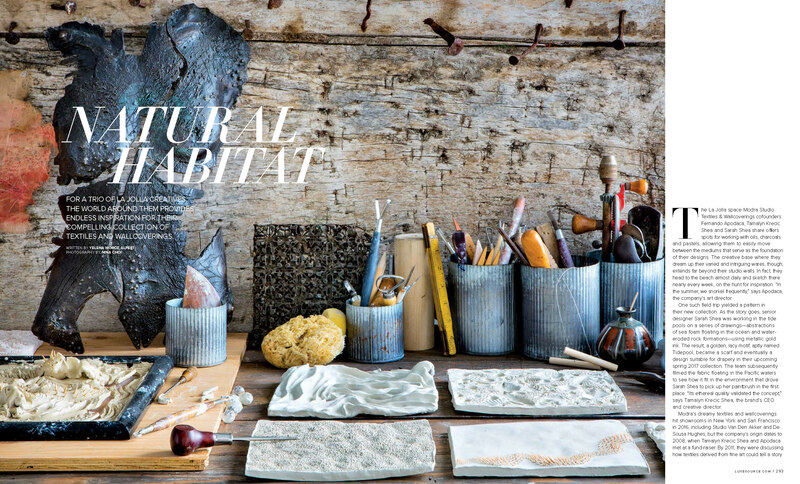 Modra Studio’s offerings defy easy stylistic categorization. Some designs brim with riotous, saturated color while others are restrained, understated and monochromatic. They’re most often rendered in cotton, linens and velvets and may be embroidered, digitally printed or hand- silk-screened depending on the design. In the case of Glyph, featuring curvilinear line drawings inspired by the sea life of the South Pacific, the team opted for hand silk-screening the design on natural linen to give it a warmer, more organic feel. For Turkana—an allegorical design rendered first in carved and woven paper depicting the winds that buffet Lake Turkana in Kenya—they used digital printing to capture the original artwork. 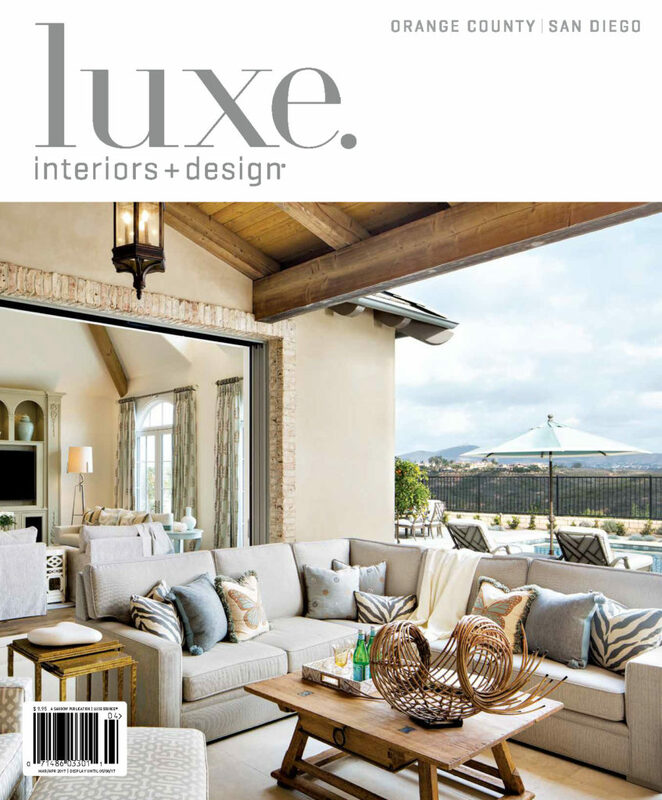 To see entire feature, please visit Luxe Magazine.